Flaky and buttery croissants made from scratch using brioche dough. Stuff them with anything you like – I chose homemade lemon curd. We leave for the summer in six days. After surveying the pantry for what will not survive three months, we determined the lemon juice, coconut and salsa are on the “must finish” list. Obviously, no recipe is going to take care of all three ingredients in one fell swoop — not one I’d want to eat, anyway! Salsa chicken and rice will be on this week’s menu. Coconut butter cookies for the staff potluck. 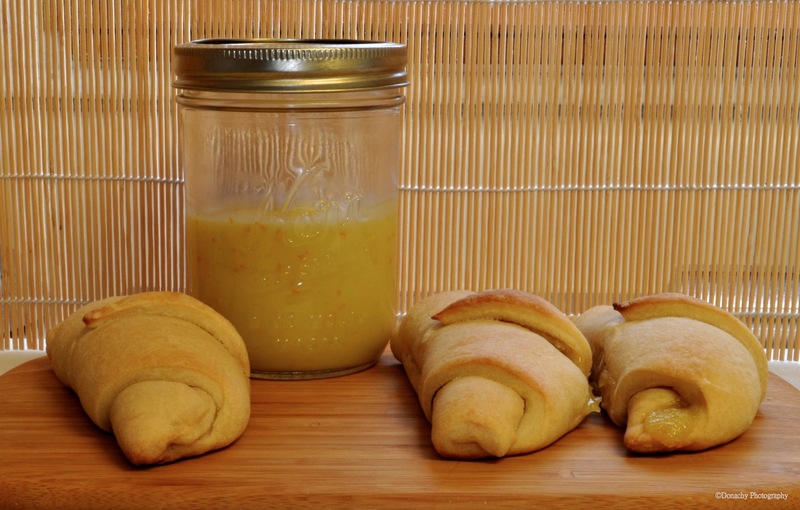 And lemon curd stuffed croissants for breakfast. From a culinary and baking standpoint, this summer should be interesting. We’ve cooked for weeks at a time in our camper. We’ve also cooked for weeks on a Coleman stove while tent and boat camping. This summer, it will be all galley cooking on our sailboat, Bandon. We’re both eager to outfit her galley with the least amount of quality tools that will help us with the most culinary tasks. We are also excited to fish the south central waters of Alaska and cook up the freshest and tastiest seafood for ourselves and our guests. Stay tuned to see what will be created from the galley of Bandon! Pour milk in saucepan and heat until lukewarm. Pour milk in mixing bowl. Add sugar. Mix until incorporated. Beat eggs. Pour eggs into milk mixture. Mix until incorporated. Add 1/2 cup of flour. Mix until incorporated. Add yeast and a second 1/2 cup of flour. Mix until incorporated. I switched to a dough hook on the mixer at this point. Add salt and last 1/2 cup of flour. Mix again until incorporated. Dough should be sticky. Mix butter into dough in increments of about 2 tbsp at a time. Once the butter is completed incorporated, cover dough with plastic wrap and refrigerate for at least 4 hours, or overnight. After at least 4 hours, place the dough on a lightly floured surface. Roll the dough out to form a circle with about a 15-inch diameter. Cut dough into 8 pieces (pizza style) using a pizza wheel, forming 8 triangles. Place a heaping tbsp of lemon curd near the base of the triangle. Roll dough from base of triangle toward point. Curve into a crescent shape and pinch ends closed. Place croissants on parchment-lined baking sheet and cover sheet with plastic wrap. Let rest for 45 minutes. Preheat oven to 350 degrees F while dough is resting. Bake croissants for 15 – 20 minutes until lightly browned. Mix together lemon juice, sugar, eggs, and zest. Mix in butter 1/4 cup at a time. Place bowl on simmering pot of water (double boiler). Stirring constantly, cook until mixture reaches 160 degrees F (about 10 minutes). Store covered in refrigerator. I used a mason jar. The above recipe used about half of the lemon curd. Enjoy the extra on scones, with yogurt, or to replace jam in any other recipe. I gotta try that! Thanks! My husband recently accepted a teaching position in Kotzebue. I enjoy all your posts and have tried several of your recipes while here in WI – I anticipate challenges in a new setting – especially with diet, but find relief with the options you give and recipes you share. Thank-you! Congratulations on your husband being offered a job. You’ll have some fish in Kotz – salmon, char and whitefish. Caribou, too and maybe moose. People will very likely gift you with food such as this. Kotzebue is a hub up here – many of us further out in the bush fly through on our way to Anchorage and Fairbanks. We hope you’ll stay in touch. Things can be… how do I say this diplomatically… kinda crazy in the bush. You may walk into the position of your dreams… or something quite a bit less than that. Let us know if there is anything we can help you with. Thank-you for the words or encouragement. We did not make this decision over night (actually it took us a year of planning). Kotz was one of my husbands top 4 choices of teaching locations (I am a nurse and we researched the health care system/job ops for me as well). Having lived in Wisconsin our entire life, my husband is an avid hunter and fisherman. Venison and pan fish are the base of many meals (and my recipes). I smiled when I saw your spice selections, we are very familiar with Penzey’s Spices and use them often. We are leaving a town of 1,400 people. The high school my husband is leaving has 265 students. He teaches English/History.. He has coached at this school for 24 years (wrestling/football/track). Saying good-bye will be difficult, but we are ready to begin a new chapter in our lives (the state of WI and our current Governor have helped many teachers make this decision). Our life is rather simple (wants vs. needs and less=more). Again, despite all the research of teaching in the bush, we are certain nothing can compare to actual experience. Any advice you care to share regarding things we will truly NEED (and may forget to send) are appreciated. I must have 10 lists started around the house (daily I add items). Yes, we’ve been reading about politics in Wisconsin (and Ohio, and other states). If you have any questions about gear or clothing or household goods… There are two very different strategies for living in the bush: 1) Most teachers take a minimalist approach, bringing up inexpensive items – and not very many at that. 2) A few people – us included – view this as our home. So we have good cookware, art, books and so forth and have made our house into a real home. Both ways have their proponents and their advantages. 1) Muck Boots. We both have a pair of The Original Muck Boot Company’s Wetland model. We were recently out for five hours on the frozen sea, these were our boots, and our feet were warm. They are comfortable hikers for fall berry picking, adequate for fishing from river banks, and good hunting boots. We both have full-on big, heavy “Arctic” boots, but barely use them. Too clunky. 2) Mountain Hardware Down Coats. Barbra thinks they were called “Zero” coats. They’re warm – 600 fill. You can sew a ruff on the hoods. 3) A Zojirushi BBCC-X20 bread maker. Built to last, makes turning out all kinds of bread (and other things) a jiff. 4) An extra upright, manual-defrost freezer. Food keeps a long time in a manual defrost freezer, and having the extra one (we have two, one compliments of the school district) has made it possible to stock up on fish in the fall and to make large quantities of soup, chili, stew, etc. to freeze. 5) REI wind-proof fleece pants. These are amazing. Real comfortable, real warm, easy to walk in. 6) Good mittens. We have Grandoe Gore-Tex mittens. On really cold days, gloves aren’t warm enough. Our advice is to bring along things you love. Teachers can – and do – go crazy out in the bush. The ones who do are usually the ones who talk in terms of “putting their lives on hold” while they “tough it out” for a school year in relatively empty, cheerless apartments/houses. We come home to a house full of our books, our favorite pieces of framed art, nice dinner settings, a good music system and good cookware every day. It makes life a real joy, and we can truly say that we LOVE living up here. Click here for a post about one way to ship goods out to the bush. Or type in “provisioning” in the search bar on our blog. Wow! That looks to die for! I like to bake but … I can’t hold a candle to you. Thanks. Traveling in six sleeps…can’t wait!